Present: Proj M. V. Rajya Lakshmi, MA., M. Ed., M. Phil. 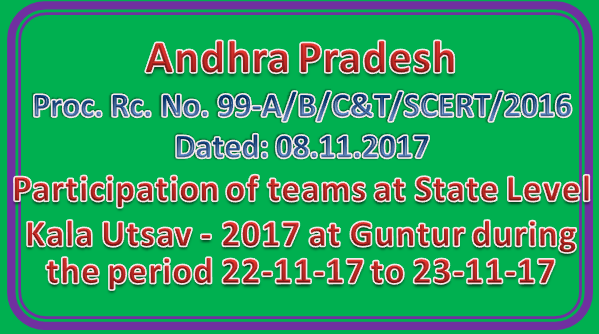 Sub: SCERT, AP, Amaravati participation of teams at State Level Kala Utsav - 2017 at Guntur during the period 22-11-17 to 23-11-17 — Regarding. Dt. 31-05-2016 of GoI, MHRD, New Delhi. In this regard the District Educational Officer Guntur shall inform the venue and accommodation etc., to all DEOs in the State very soon about the State Level Kala Utsav-2017 competitions. Further all the DEOs in the State are requested to send the 1st Prize winners along with one guide teacher in each art form to attend the State Level Kala Utsav-2017 competitions which will be held at Guntur from 22-11-l7 to 23-11-17. Note: All the 1st prize winners in the state in DANCE art form should perform “Punjabi” dance at State Level Kala Utsav -2017 Competitions at Guntur as our State is paired with Punjab State.